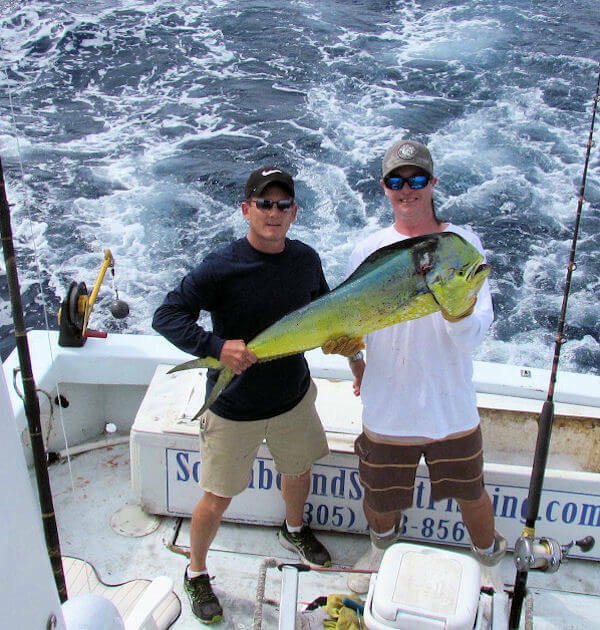 … for fishing in Key West.There have been a good, but not great, number of dolphin offshore. On half days, we’ve had great action with big Bonitos, a few Dolphin and an occasional Wahoo inshore. We caught the largest Wahoo I’ve ever caught as Captain on July 16th on a half day trip. Adam Banks is my 1st mate and he did a great job on the fish. It was 76 lbs. It’s the 3rd Wahoo I’ve had on board in the 70+lb range. I also have a 72 lb’er caught with Paul Murdoch as 1st mate and a 74 lb’er caught Dan Smith as 1st mate. All three big Wahoo’s were caught in relatively shallow water. This one was in 109 ft of water just outside the reef. The other 2 were in 180 ft of water or less. All 3 were caught in the same area, between the reef known as the 9 Ft Stake and the reef known as the Toppino marker and all in the middle of the summer. I can’t remember if the 72 & 74 lb’ers were females or not, but this 76 lb’er was. I have to think that area may have some significance as a spawning area………or it’s just coincidence. 3 big fish is too small a sample to make a definitive study, but I will continue to work that area in the summer months just in case. On longer trips we’ve been heading offshore and most days catching enough to make it a good day. There was not a lot of Sargasso Weed around through most of July, but early August made up for that with a tremendous weed line that passed though the keys. We fished the same weed line for 8-9 days with a 2+kt current. That means the weed line was probably over 400 miles long. It’s amazing when you think about it. Although there were not a tremendous amount of big dolphin, there was a great number of school sized fish which makes for steady action and a great day. The early part of the summer there were an unusually large number of Marlin seen and hooked offshore. I had hoped this would make this years KW Marlin Tournament one of the better tournaments of recent years, but unfortunately the marlin fishing tapered off just before the tournament and the winner caught the only marlin that was caught in the tournament. I was not in the Tournament and I guess I’m glad. We fished most of the days of the tournament with just regular customers and none of the pressure of looking for a fish that, it turned out, wasn’t around. I generally stay out of the tournaments and I think I’ll continue to do so. Lots more stress that I can live with out putting myself and 1st. mate through. There have been some Sailfish still around. No rhyme or reason to where. Just got to get lucky and drive over one. We have released a few in the last couple weeks.